I double the spices and add lemon juice, cider vinegar, and a bay leaf. This is a nice combination of vegetables; I added several optional items--artichoke hearts, grape tomatoes, feta cheese. The dressing was quite bland, however, & did not add much to the finished dish. Definitely needed something to perk it up. Size-wise, this is good for a crowd. Easy and delicious. Cooked chickpeas with sage, bay leaf, and black pepper before marinating. Very yummy, used the red wine vinegar instead of balsamic. This was good at room temp, as well as hot. Excellent and easy. Great with toasted rye or pumpernickel bread. Also good with steamed broccoli or small potatoes. Variation = optional sesame seeds? 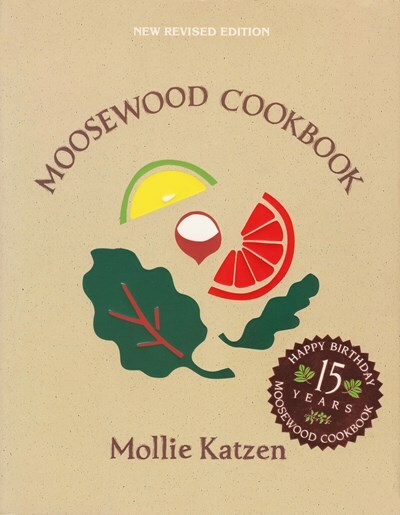 Great casserole recipe from Moosewood! I added some pre-cooked kale as well. I used part skim ricotta rather than cottage cheese. The recipe was a bit watery when I put it in the oven, but the casserole set perfectly in the oven. Crowd pleaser! These were alright; nothing extraordinary, but perfectly satisfactory. Some spices might make them a bit more interesting, but I wasn't kicking myself for not adding any. This has a great combination of flavors. The texture is not as dense and decadent as other, richer quiche recipes, but nothing shocking considering the ingredients. Good stuff. The crust was a bit soggy the first time I made it, so now I blind bake it before adding the filling. Problem solved. I've made it without the caraway seed when I didn't have any and not noticed any great loss. Yum! This took longer to make than I'd initially thought, since my filo dough was a bit aged and the sheets had broken into strips. The strudel looked a bit mummy-like, but the flavor was good. I sprayed olive oil on with a pump spray instead of brushing with oil, worked great. All chopped up, used about 1 1/4 lb broccoli, 6oz whole wheat bread for the crumbs, and 8oz cheddar. Love this recipe- made many many times. I love the filling recipe. Very adaptable, for example you can use powdered ginger if you don't have fresh. I don't use the dough recipe, instead I use kittencal's from the Internet. Great vegetarian lunch idea. Had it along with a green salad and it was great.